We hope this newsletter finds you all well. Across Florida, the mid-point of the summer rainy season is upon us. In most of Florida, most rainfall is observed during the summer compared to the fall through spring. An exception to this is seen in the far northern part of the state, roughly north and west of Gainesville, where a secondary wet season occurs from December to February, a time of year when cold fronts press far enough south to bring rains. Summer rains tend to arise from convection, which manifests itself as heavy showers or thunderstorms. These thunderstorms are largely triggered by boundaries (zones of lift) delineated by sea breezes, which are plentiful in a state defined by a peninsula and a panhandle all of whose area resides fairly close to the Gulf of Mexico. Consequently, on any given day, thunderstorms may affect one area while another area just a few miles, or even blocks, away is unaffected. 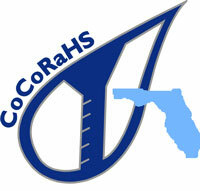 CoCoRaHS is only as strong as its observers! So, thank you for your continued efforts for the network. Your efforts allow a variety of data-users to better understand the spatial variability in rainfall in Florida. At some time or another, most of you will travel away from home for a period of time for vacation, preventing you from checking your gauges every day. When you return, you may find that rainfall has accumulated over multiple days. 1 May 2017, South Miami Heights 6.4W, Miami-Dade County (MD-59): "Received 0.02 of precipitation. Also had a "potato"' bug in the inner tube but I hope it did not drink too much to alter the readings. Unfortunately, he/she drowned. In lieu of flowers, please send donations to the CoCoRaHS organization." 2 May 2017, Clermont 0.4SW, Lake County (LK-10): "Yesterday was the first day in forty forevers that we experienced the smell of rain. You could see bands of rain in the far distance. There was a promise of rain while looking across Lake Apopka. A few rain drops fell with windy conditions. It was wonderful to watch clouds forming. Much hope that the brutal spring dry period will break sooner than later." 6 June 2017, Delray Beach 2.3WSW, Palm Beach County (PB-82): "Accurate." 28 June 2017, Fort Pierce 5.1SSW, St. Lucie County (SL-33): "Becoming overcast toward 5:00PM, with some flashes of distant lightning and low, rumbling thunder around 6:30PM accompanied by a short-lived downpour. Cleared by 7:45PM." 18 July 2017, Ellenton 6.6E, Manatee County (MA-6): "T-storm moved south to north with 0.55 inches in 15 minutes, 3:00-3:15 PM, and 1.02 inches in one hour with lots of cloud-to-ground lightning. Golf course 3 miles northeast was flooded." In the spring, we were discussing drought in Florida, which, in some areas in the central and southern parts of the state, reached the "extreme" (D3) classification on the U.S. Drought Monitor (USDM). This drought was reaching its greatest intensity in late May, as shown in the graphic of the 30 May USDM. Then, during June, the summer rainy season began in earnest, which is not unexpected climatologically. However, June was exceptionally wet, ranking second-wettest on record since 1895 statewide. The wetness led to a quick reversal of the drought conditions so that all areas of drought and abnormally dry conditions were eliminated from Florida by the time of the USDM released on 29 June. Conditions remain the same as of the 18 July USDM, the latest one, as shown below. The outlook for drought is for the status-quo to be maintained as suggested by the below outlook from NOAA's Climate Prediction Center. The 2017 North Atlantic hurricane season officially got underway on 1 June. So far, it has proven to be active, although no tropical cyclones have hit Florida directly. Activity started early, in April, with the formation of Tropical Storm Arlene in the open waters of the north Atlantic Ocean, where it remained for its entire life cycle. Later, in mid-June, a disturbance came out of the so-called Main Development Region (MDR), which includes the tropical north Atlantic Ocean and Caribbean Sea between 9.5°N and 21.5°N latitude, and became Tropical Storm Bret, which skirted the far southern Caribbean Sea. Bret was noteworthy for being the earliest tropical cyclone to develop in the MDR on record. Around the same time, Tropical Storm Cindy was christened in the Gulf of Mexico and made landfall near the Texas-Louisiana border. Cindy's outer bands brought heavy rains to much of the Florida panhandle. Ultimately mired by dry air aloft from the Sahara Desert in Africa, Tropical Depression Four formed in the MDR in early July. Most recently, Tropical Storm Don formed in the MDR and churned through the Lesser Antilles. Even though none of the storms has affected Florida in a significant way, they point to the start of an active season. Should the high rate of activity continue, the odds of a Florida landfall later in the season are increased.